You Are Missed is a work in progress. This is a new portrait series project I developed during the artist residency at Axenèo7 in Gatineau, Canada early 2017 and I hope to return to carry this out in the future. You Are Missed is a art project commemorating and honouring the many missed and murdered indigenous First Nations, Inuit and Métis women and girls of Canada through a large portrait series in the public space around cities in Canada. 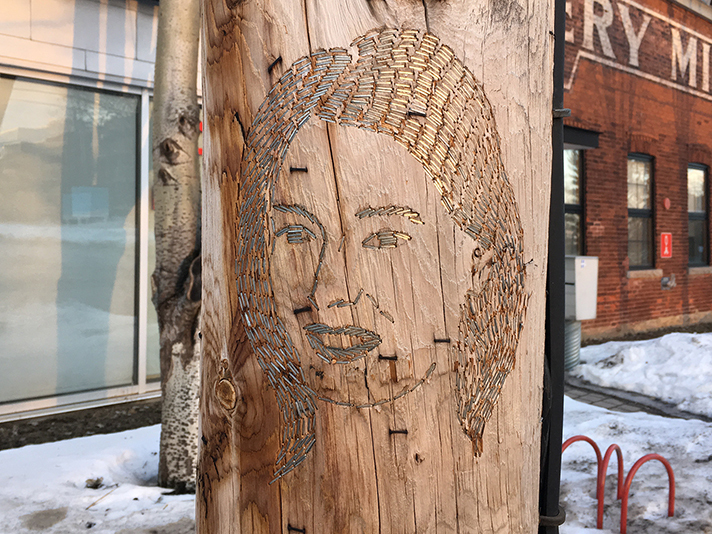 You Are Missed consists of many portraits of the women and girls created through numerous metal staples that are shot by using a compressed-air staple gun onto wooden transmission poles at particular locations around the city. The large network of those transmission poles supporting wires for electrical power distribution, coaxial cable for cable television, and telephone cable are still also used as public ‘message boards’ to share news and make a announcements on posters or hand written notes. Ones the paper is removed or faded, the news is forgotten, but what remains at the end are the staples that were used to fasten the paper. Hens, the stapled portraits would remain and look back at the passer-by reminding that they are remembered and still missed. I have developed this particular technique with working with the staple gun – while aware of its symbolic significance as a weapon. I have applied this way of working in projects that are primarily concerned with the politics of memory and belonging, particularly in relation to colonial residue left in the environment. Many of the crimes against the women and girls haven’t been resolved and it is a big problem for the affected families and communities that needs attention. Several initiatives by the victims families, communities, friends and associations are organized such as the Feb 14th Annual Womens Memorial March held since 1990, the touring exhibition We walk with our Sisters (2013) and the documentary Finding Dawn (2006) by known Métis filmmaker Christine Welsh are view of these projects that help to raise awareness of this ongoing unjust treatment of Indigenous women and girls and which contribute in the healing process of the great loss collectively. Acts of violence against Indigenous women and girls may be motivated by racism, or may be carried out in the expectation that society’s indifference to the welfare and safety of these women will allow the perpetrators to escape justice. Excerpt, page 3: Violence against indigenous women and girls in Canada: A summary of Amnesty International’s concerns and call to action. To make You Are Missed possible I seek to meet and share this idea with key persons from the community and the Native Women’s Association of Canada to see if there is interest from their side and the families to collaborate with me and see You Are Missed as a effort that could add to the collective efforts to highlight this tragic reality that comes from the deep rooted racism against the Indigenous body and way of life as a whole.